This is the script for a talk that I'm planning to give tomorrow at BarCamp Philly. The talk is a “live committing” exercise, and this post contains all the information needed to follow along. With some links to relevant source material and minus my pauses, typos, and attempts at humor. I think the first thing to understand about Git is that it's not strictly a source control system; it's more like a versioned filesystem that happens to be good at source control. Traditionally, source control systems focused on the evolution of files. For example, RCS (and its successor CVS) maintain a separate file in the repository for each source file; these repository files hold the entire history of the file, as a sequence of diffs that allow the tool to reconstruct any version. Subversion applies the idea of diffs to the entire repository, allowing it to track files as they move between directories. Git takes a different approach: rather than constructing the state of the repository via diffs, it maintains snapshots of the repository and constructs diffs from those (if you don't believe this, read on). This allows very efficient comparisons between any two points in history, but does consume more disk space. I think the key insight is not just that disk is cheap and programmer time expensive, but that real-world software projects don't have a lot of large files, and those files don't experience a lot of churn. To see Git in action, we'll create a temporary directory, initialize it as a repository, and create a couple of files. I should note here that I'm using bash on Linux; if you're running Windows you're on your own re commands. Anything that starts with “>” is a command that I typed; anything else is the response from the system. > git commit -m "initial revision"
Running git log shows you this commit, identified by its SHA-1 hash. What you might not realize is that a commit is a physical object in the Git repository, and the SHA-1 hash is actually the hash of its contents. Git has several different types of objects, and each object is uniquely identified by the SHA-1 hash of its contents. Git stores these objects under the directory .git/objects, and the find command will help you explore this directory. Here I sort the results by timestamp and then filename, to simplify tracing the changes to the repository. Each commit represents a snapshot of the project: from the commit you can access all of the files and directories in the project as they appeared at the time of the commit. Each commit contains three pieces of information: metadata about the commit (who made it, when it happened, and the message), a list of parent commits (which is empty for the first commit but has at least one entry for every other commit), and a reference to the “tree” object holding the root of the project directory. Tree objects are like directories in a filesystem: they contain a list of names and references to the content for each name. 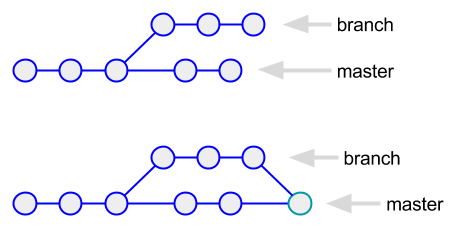 In the case of Git, a name may either reference another tree object (in this example, the “bar” sub-directory), or a “blob” object that holds the content of a regular file. As I said above, an object's SHA-1 is built from the object's content. That's why we have two files in the project but only one blob: because they're both empty files, the content is identical and therefore the SHA-1 is identical. Now let's create some content. I'm generating random text with that I think is a neat hack: you get a stream of random bytes from /dev/urandom, then use sed to throw away anything that you don't want. Since the random bytes includes a newline every 256 bytes (on average), you get a file that can be edited just like typical source code. One thing that's non-obvious: Linux by default would interpret the stream of bytes as UTF-8, meaning a lot of invalid characters from the random source; explicitly setting the LANG variable to an 8-bit encoding solves this. In the diagram, you can see what happened: adding content to the file created a new blob. Since this had a different SHA-1 than the original file content, it meant that we got a new tree to reference it. And of course, we have a new commit that references that tree. Since baz.txt wasn't changed, it continues to point to the original blob; in turn that means that the directory bar hasn't changed, so it can be represented by same tree object. One interesting thing is to compare the size of the original file, 642,217 bytes, with the 496,994 bytes stored in the repository. Git compresses all of its objects (so you can't just cat the files). I generated random data for foo.txt, which is normally uncompressible, but limiting it to alphanumeric characters meant that each character only takes fit in 6 bits rather than 8; compressing the file therefore saves roughly 25% of its space. When we look at the objects, we see that there is a new blob that is slightly larger than the old one, and that the commit object (c620754c) is nowhere near large enough to hold the change. Clearly, the commit does not encapsulate a diff. Before moving on, I want to call out Git's two-level directory structure. Filesystem directories are typically a linear list of files, and searching for a specific filename becomes a significant cost once you have more than a few hundred files. Even a small repository, however, may have 10,000 or more objects. A two-level filesystem is the first step to solving this problem: the top level consists of sub-directories with two-character names, representing the first byte of the object's SHA-1 hash. Each sub-directory only holds those objects whose hashes start with that byte, thereby partitioning the total search space. Large repositories would still be expensive to search, so Git also uses “pack” files, stored in .git/objects/pack; each pack file contains some large number of commits, indexed for efficient access. You can trigger this compression using git gc, although that only affects your local repository. Pack files are also used when retrieving objects from a remote repository, so your initial clone gives you a pre-packed object directory. OK, you've seen how Git stores objects, what happens when you create a branch? If you look in .git/objects, you'll see another three objects, and at this point I assume that you know what they are. This isn't quite the entire story. For one thing, it omits tags, stored in .git/refs/tags. Or “unattached HEAD” state, when .git/HEAD holds a commit rather than a ref. And most important, remote branches and their relationship to local branches. But this post (and the talk) are long enough as it is. The simplest type of merge — indeed, you could argue that it's not really a merge at all, because it doesn't create new commits — is a fast-forward merge. This is the sort of merge that we'd get if we merged our example project branch into master. 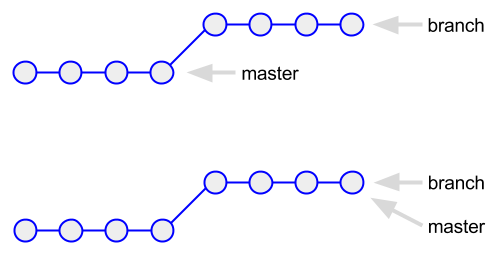 Topologically, the “branch” represents a straight line, extending the last commit on master. Therefore, “merging” the branch is as simple as re-pointing the master reference to that commit. I'll start this section with a rant: one of the things that I hate, when looking at the history of a project, is to see a series of commits like this: “added foo”; “added unit test for foo”; “added another testcase for foo”; “fixed foo to cover new testcase”… Really. I don't care what you did to make “foo” work, I just care that you did it. And if your commits are interspersed with those of the person working on “bar” the evolution of the project becomes almost impossible to follow (I'll return to this in the next section). 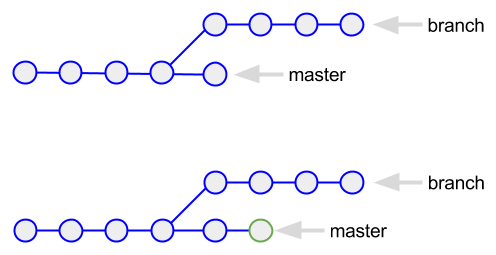 The thing to understand about squashed commits is that they're not actually merges: there's no connection between the branch and master. As a result, “git branch -d my-branch” will fail, warning you that it's an unmerged branch; you need to force deletion by replacing -d with -D.
To wrap up this section: I don't think you need to squash all merges, just the ones that merge a feature onto master or an integration branch. Use normal merges when pulling an integration branch onto master, or when back-porting changes from the integration branch to the development branch (I do, however, recommend squashing back-ports from master to integration). To understand what I dislike about “normal” merges, we need to do one. For this we'll create a completely new repository, one where we'll compile our favorite quotes from Lewis Carroll. We start by creating the file carroll.txt in master; for this section I'll just show changes to the file, not the actual commits. So, what does it mean that git log produces the illusion of a series of merged commits? Consider what happens when you check out one of the commits in the list, for example 2e68e9b9. This was a commit that was made on the branch. If you check out that commit and look at the commit log from that point, you'll see that commit 5269b074 no longer appears. It was made on master, in a completely different chain of commits. In a complex series of merges (say, multiple development branches onto an integration branch, and several integration branches onto a feature branch) you can completely lose track of where and why a change was made. If you try to diff your way through the commit history, you'll find that the code changes dramatically between commits, and appears to flip-flop; you're simply seeing the code state on different branches. Wrapping up: how safe is SHA-1? “Everybody knows” that SHA-1 is a “broken” hash, so why is it the basis for storing objects in Git? The answer to that question has two parts. The first is that SHA-1 is “broken” in terms of an attacker being able to create a false message that has the same SHA-1 hash as a real message: it takes fewer than the expected number of attempts (although still a lot!). This is problem if the message that you're hashing is involved in validating a server certificate. It's not a problem in the case of Git, because at worst the attacher would be able to replace a single object — you might lose one file within a commit, or need to manually rebuild a directory. That's an active attacker, but what about accidental collisions: let's say that you have a commit with a particular hash, and it just so happens that you create a blob with the same hash. It could happen, although the chances are vanishingly small. And if it does happen, Git ignores the later file. So don't worry, be happy, and remember to squash features from development branches. And that's also why you actually always want to use git fetch and not git merge. @ThomasMeyer - I apologize for not publishing your comment earlier; if I don't go to the moderation page as soon as I get notified, I tend to forget. I'm not sure what you're referring to wrt fetch versus merge, because they perform two different functions. I'll assume that you actually meant "pull" rather than "merge". And if that's the case, then I think you might have a process issue.